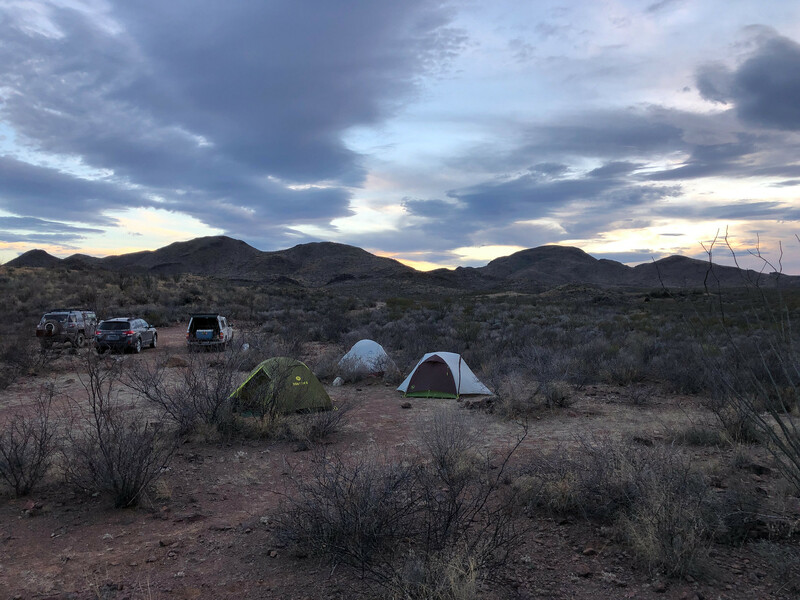 Long-planned camping trip to BBNP with friends (my excuse was combination retirement and delayed 60th birthday celebration) was a no-go due to reasons beyond our control documented elsewhere. I booked 4 nights Papalotito Colorado sight unseen because i was afraid the push from BBNP would absorb all the reachable sites. But I actually started in Seminole Canyon SP, just a few hours from Austin and sets up an easier drive on day two. I got my usual site at Seminole (#10), which was almost empty, except for the trailer/rv across from me which kept their whole site illuminated all night long because....? #10 is below the road and kinda shielded from others but a nice view. It rained all day driving out there, cleared up in the evening but a strong wind combined with drizzle overnight left everything wet, and as the front passed everything froze, so i didn't get loaded until 10AM the next day. I've been to BBRSP a few times; I've done day hiking off the River Road, camped along there once, and stayed 5 days in the interior back in 2009-2010. So I an not a total noob there. One friend joining me had experienced the River Road day hiking, and the other friend has extensive BBNP experience but none in BBRSP so I was happy to introduce them to the interior. A note on the site Papalotito Colorado. First, TPWD calls it Papalito Colorado on some maps. Go figger. Second, I was cautioned it's "close" to a couple other roads. It is, about 1/4 mile from the main park road and closer to the Yedra road. But not close enough to where it would bother you or feel "observed." Not ideal, but not terrible. THe Yedra road is so rarely traveled you may hear/see two vehicles a day, max. The view north from the site is dominated by La Mota. At the site, there is a now-closed old road leading down to the old animal pens and namesake windmill. There is a wash down there with with (as of last week) water in pockets in the rock. And the brush around the old pens seems ideal for critter habitation, but the only ones we saw around there were cattle. Took a drive down the River Road (170) which many of you are no doubt familiar with, on Saturday. 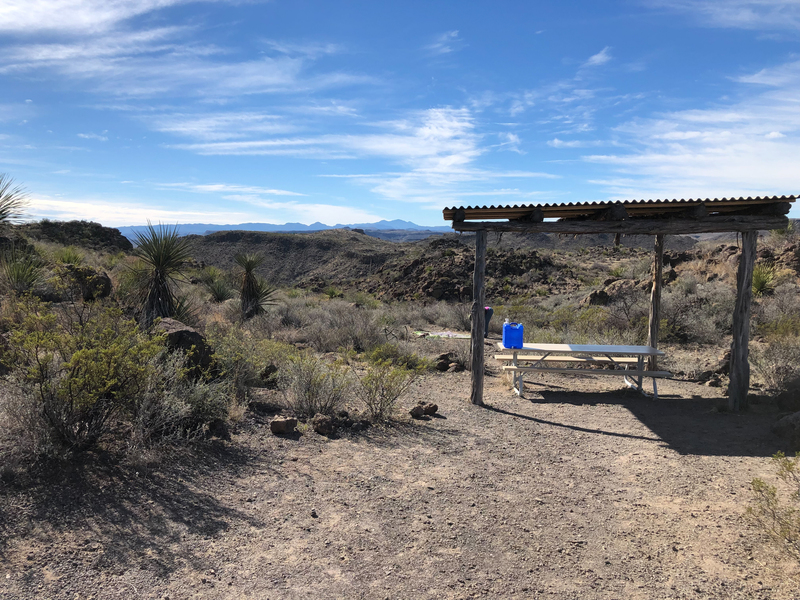 Sunday rode around the main park road to the eastern end, to Los Alamos residence, to Tres Papalotes, down into the Solitario and Burnt Canyon trailhead, back up to what was new to me, the Llano loop and Puerto Chilicote TH. I took almost no pictures on that drive, but had to stop at this view of twisted and folded rock from the East Llano leg looking back East. One friend left the next day; the two of us left moved camp to Fresno Vista. My friend had booked that night sight unseen, and while I'd camped back in 2009/10 at Pila Montoya 3 i had no idea what FV was like. I was amazed; definitely the most scenic site I've camped in at BBRSP yet. When we'd arrived, the couple at the site had not finished packing up; they warned us about the winds, and how they'd ended up having to tie their tent to the picnic bench roof posts to keep it down the previous night. 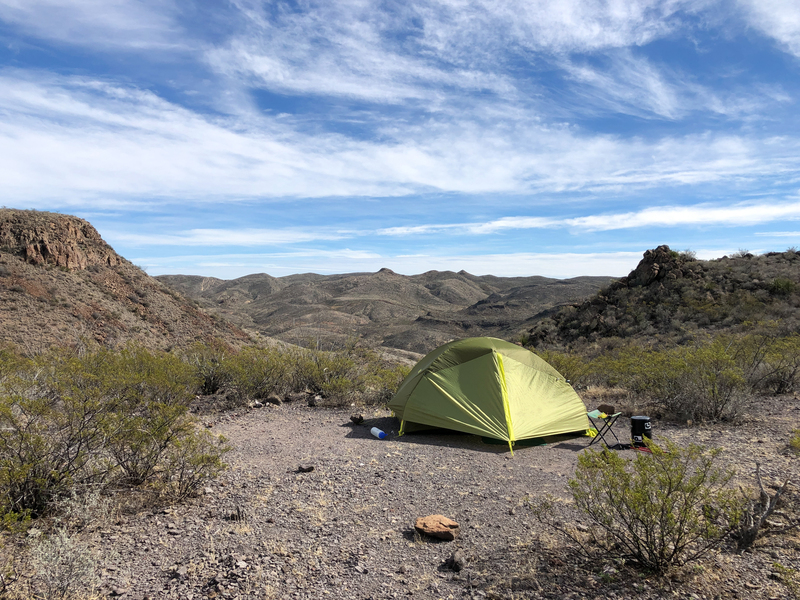 I set up my tent on the little saddle there, warily, with a nice view and only mild winds at the time. 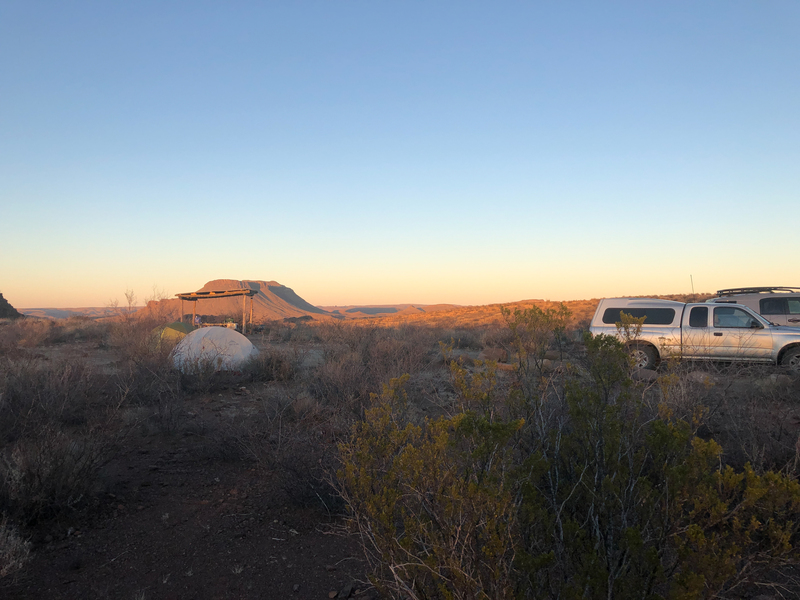 There is a easily accessed higher spot immediately south of the site; just follow animal/use trail and you'll get up to another level; then scramble a bit over boulders and/or yucca and you'll find yourself on a beautifully exposed little mesa, with views nearly 360. If you camp at FV you *must* go up there. and i'm old, I've seen a bunch! PS-the wind that night? Dead calm. Absolutely no wind. La Mota looks like it would be fun to explore. Really loved the views of/from Fresno Vista. 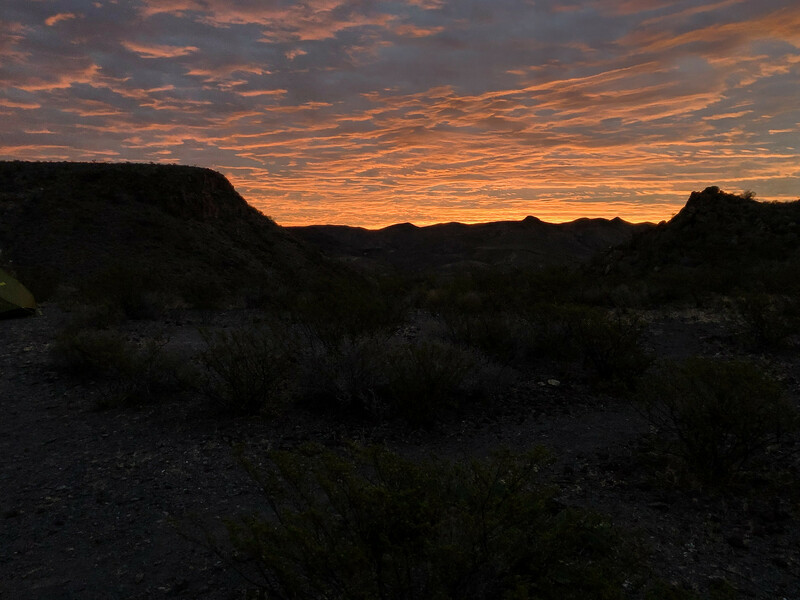 "Sunday rode around the main park road to the eastern end, to Los Alamos residence, to Tres Papalotes, down into the Solitario and Burnt Canyon trailhead"
How were the roads on this drive ? What are you driving ? No pictures at all ?? Ha, sorry! That day I was a passenger in my buddy's Toyota FJ. I'd done most of that drive back in 2010 on my own, so I pretty much just enjoyed the scenery but didn't take but a handful of photos. I find sometimes I become a slave to the camera, and enjoy sitting back and watching rather than futzing with the technology. Sometimes, not always. As far as the roads; the main park road was fine, as has always been my experience. Only some washboarding on some of the hills, but no biggie. I'm in a Toyota Tacoma 2wd and it was easy. The drives to the campgrounds, Pap. Col., and Fresno Vista were rougher. Pap. Col. is short though and not that difficult. FV is longer, kinda slow going for me mostly to avoid flats, overhanging succulents, etc.. Don't know that I would take that road in a regular passenger vehicle. The Llano loop was pretty smooth, too. The road down to the Solitario and Burnt Canyon seemed to me, in 2010 in my Tacoma, very difficult for my 2wd. But last week with my friend's FJ it seemed pretty easy. I honestly don't know if my perception/memory is wrong, if the road is better, or it's just the difference between being a passenger in an FJ vs. driving a Tacoma. Here's a link to my flickr album from my trip in 2010 https://flic.kr/s/aHsjF9SdL1 which has photos that I didn't take this time. Oh, forgot to mention; we passed by "the bar" but didn't stop. Someone was there. Happy Birthday and congratulations on retirement! And thanks for the link. There is one picture of a really bad washout , did you go thru that in your 2wd or find a way around it ? um, remind me; which photo? That gorgeous. The formation really reminds me of "Los Caballeros" visible on the west side of 385 between Persimmon Gap and Marathon. I got my usual site at Seminole (#10), which was almost empty, except for the trailer/rv across from me which kept their whole site illuminated all night long because....? +1 on the sunrise!!!!!! I've never seen a better one. Also, the wind has been really unpredictable this season. Mule Ears, Flash, and I were all in BBNP the week of December 8-14, and it see-sawed back and forth between calm(ish) and hurricane(ish). Sounds like you made the best of the shutdown. Congrats on a successful beginning to retirement!!!! Think of all the trails you can explore now. LOL...maybe he was chomping too aggressively for their comfort. +1 on the sunrise, absolutely breathtaking! The wind is unpredictable like that all the time. Numerous times when I've been out at my place, I'll be working outside or sitting on the patio reading, and it just seems to pick up out of nowhere and everywhere (E, W, N, or S); clouds, no clouds, partial clouds, it doesn't matter. Weird. The cool thing is, I can hear it coming as it sweeps through the ocotillo and creosote bushes on the surrounding hills. The gusts can sound like a train sometimes. The cool thing is, I can hear it coming as it sweeps through the ocotillo and creosote bushes on the surrounding hills. The gusts can sound like a train sometimes. I've had that experience, too, and it's wonderful. Spooky, but wonderful. Ahhh, that was from the 2010 trip. You're making me exercise my memory muscles here...I looked at the album and I'm pretty sure that's in the middle of a hike I did down from Pila Montoya #3 campsite down to Fresno creek, where it hits a 4x4 road. The "trail" i took is an old and long unmaintained road; I was noting some of the washouts/gaps in the trail as being even a pain for a bike. Definitely wasn't driving on that one. Maybe I ought to have captioned more of those...I'll get to it. Tomorrow!